Free the King and Princess who are being held by your nemesis Death Adder in his castle. Play as either Ax Battler the Barbarian, Tyris Flare the Amazon or Gilius Thunderhead the Dwarf and take your revenge as you hack and slash your way past his evil servants and guardians who block your path. As well as a variety of mean moves, each individual character has his or her own exclusive elemental magic that varies in strength. 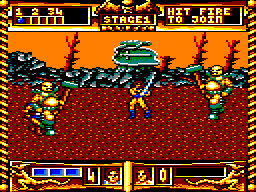 This is an excellent and faithful conversion of the arcade hit with some of the best graphics ever on the CPC. You are a Buddhist monk in the Orient, who must achieve enlightenment by lighting incense before the statue of Buddha in a golden temple. Your journey starts with you as a young monk, and as the game progresses, you become older, eventually dying at the age of 100. The game sees you meeting various characters who may be friendly or hostile. You will find objects – but one of the big problems with the game is that I simply could not figure out how to make use of any of them! Another problem is that it accesses the disc all the time and this slows everything down a lot. 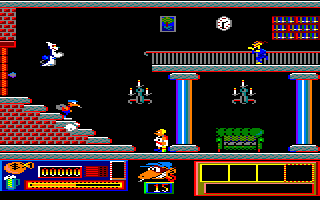 The backgrounds for each room are well drawn, but a potentially interesting game is ruined by poor design and implementation. The Golden Tail has been broken into thirty pieces by the evil Shogun, and the pieces have been scattered across the land. You are the ninja spy Kitsune, and you must retrieve all of the pieces of the talisman in order to restore law and order to the land. 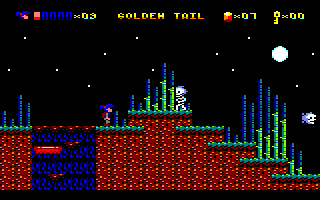 This is a simple platform game with a variety of enemies to dodge such as skeletons, vampire bats, samurai warriors and ghosts, but it's innovative in that Kitsune has magical powers. He can become invisible for short periods of time, but during that period, he is able to move faster and jump higher, and none of the enemies will hurt him. 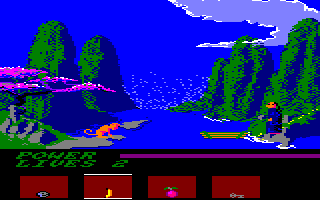 The graphics are colourful and well drawn, although the music is nothing special. While it takes some practice to master the use of magic, the game is fun to play once you get the hang of it. This general knowledge quiz emulates the final round of the popular TV game show Blockbusters. This in itself is a little odd; why offer the player only the final round? Game-wise, it more or less matches the TV show's challenge but it does feel incomplete without the first and second rounds of the game. Good typing skills are required to overcome the harsh time limit on some of the harder difficulty levels – one spelling mistake and you've lost a section of the grid. A very poor offering from Macsen. Fly your spaceship along a long corridor, shooting the obstacles and hazards in your way. Once you've reached the end of the corridor, you fly along another one. The corridor sections are viewed in isometric 3D reminiscent of the classic coin-op game Zaxxon. 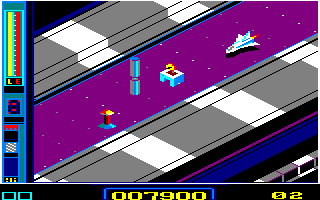 If you can complete both corridors, you then play a short section viewed through the cockpit of your spaceship, in which you must shoot aliens as they fly erratically towards you. 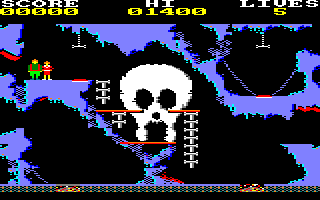 The graphics are colourful, but there is a lot of flicker and the action is a bit slow, which makes the game too easy and repetitive, and therefore not much of a challenge. Gonzzálezz is a Mexican who enjoys a siesta in the afternoons as many Mexicans do. However, this particular siesta has turned into a nightmare; he can hear an alarm clock ringing, but he cannot wake up! This game, like many Spanish games, is divided into two parts. 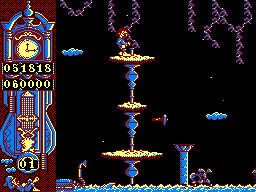 The first part is a platform game in which you must guide Gonzzálezz through a surreal landscape to reach the alarm clock and finally silence it. In the second part, Gonzzálezz crosses the deserts of Mexico to find a nice hammock so that he can take his siesta in peace. 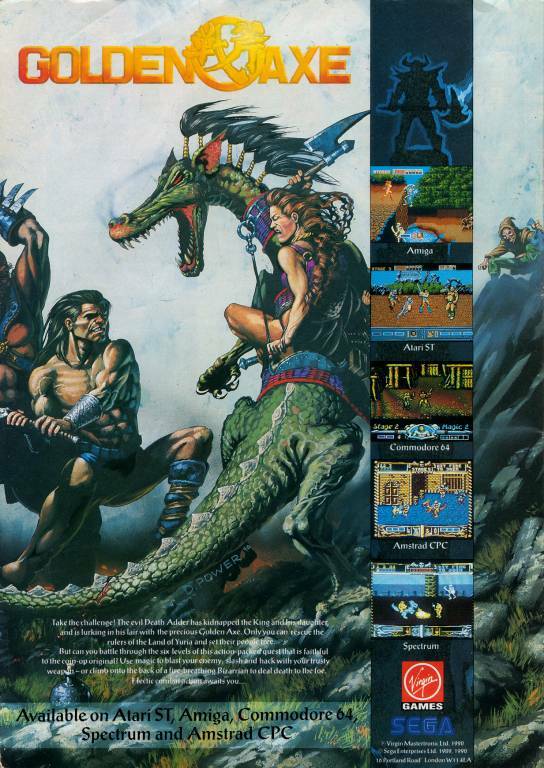 The graphics are stunningly detailed and the animation of Gonzzálezz and all the enemies to be encountered is excellent. It's just a shame that the difficulty level is too high, particularly in the second part. Goody is a thief who has set his eyes on the Bank of Spain, located in Madrid. You may help Goody in a humorous voyage across Madrid, collecting money to buy the necessary tools to do your job, while avoiding a bunch of funny characters ready to prevent him from achieving his goal. Unfortunately, Goody is far too difficult, with some screens that require skill, luck and loads of patience. Apart from that, it's quite a nice a game that's worth a few tries. 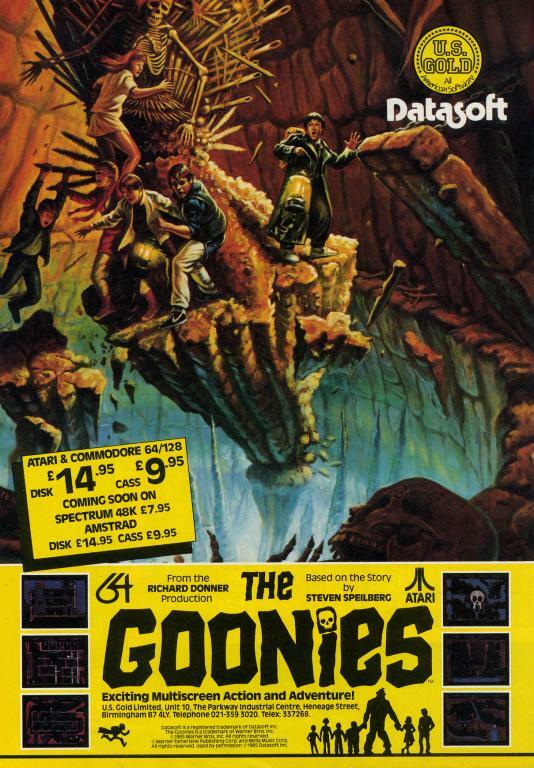 Based on the 1980s movie, this game sees you on a quest to find a pirate ship hidden deep within a cavern. Initially, it appears to be yet another platform game where you run, jump and collect things. 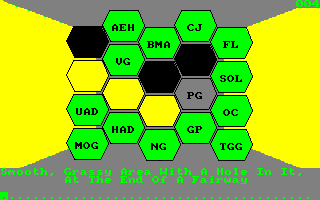 Start playing the first screen and you soon realise there is a lot of careful planning and strategy required. You play two of the kids from the movie who have to work together on each screen to make it to the next one. Pressing fire swaps between them, so one can operate part of the scenery allowing the other kid to move onwards. The Fratelli family of criminals are also on the hunt for the treasure and need to be avoided. 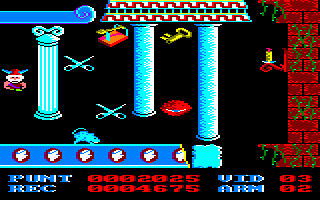 The graphics for each screen are simple but varied, with a basic tune playing throughout. Sound effects vary from screen to screen, adding some atmosphere. This is a fun, if a little simple, game where you progress from screen to screen solving the puzzles presented on each one. You move in four directions collecting artefacts to increase your score. Certain paths are blocked by all-seeing eyes which lead to death if touched. Finding the correct switch will remove them, often leading to a bonus such as an extra life. Gorbaf can call on his magic ability to freeze the hordes that block his route, but careful timing is required. This game carries the feel of one made using a game creator like Sprites Alive. A thinking man's Gauntlet. This game relies on skill and planning instead of just hitting the fire button. Your mission is to retrieve seven artefacts hidden and guarded within four towers, each comprising of seven floors. You have three distinct weapons that can be powered up, but ammo is needed. Just check out the fireball effect; it even destroys walls! 32 types of potion are to be found, and artefacts can also be collected that make you stronger. Graphically, this one is a smooth push scroll in MODE 0. Sound effects are sparse. It's a challenge indeed that seems simple at first until you realise that pressing the fire button will not always save or help you.